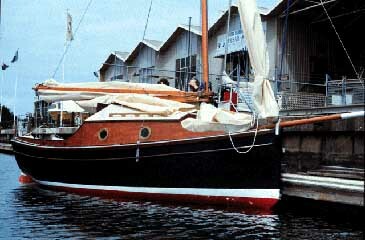 Evening Swan 17'6" gaff cutter designed by Paul Fisher and built by Christopher van der Craats. This has to be the Morris Minor of sailing boats, small in LOA, but enormous inside. You can sit up straight and lie down comfortably in her cabin, and still there's room for a sink and a small cooker. As well there is a large cockpit which can fit four adults comfortably, but squeeze in six when motoring. Saskia was built during 1997 and launched in May 1998. 1,800 Kg including trailor, gear, sails etc..
Read about how well she sails.